Rome - "Plenty of resources. 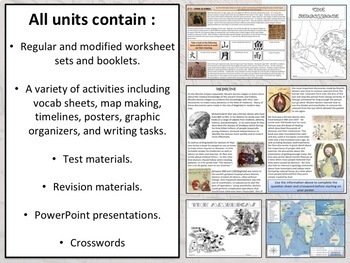 Could be used as a stand alone unit, or used to supplement instruction. You wont be disappointed in this one!." Islam - "Another incredible unit from Mr Gray! So comprehensive and creative. Jammed packed with beautiful content and student activities. Love it!!" China - "These units have been a life saver. Mr. Gray has thought of everything. There are multiple activities throughout the unit that are scaffolded to the needs of a variety of learners. The content is organized well and easy to read. The graphic organizers are relevant and useful. I am a special day class teacher who learned about this from my school's history department. 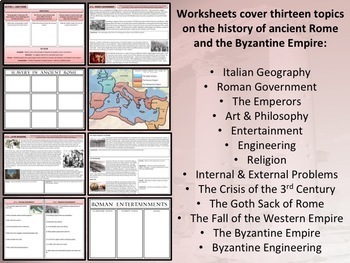 I was easily able to adapt for my students with the multiple levels of modified worksheets and alternate notes provided. There are many, many visuals with captions and embedded videos. I highly recommend for general education or the resource/SDC teacher trying to teach standards at grade level. Thank you, Mr. Gray!" Japan - "Great resource! It has given me a lot of inspiration and ideas on how to make the unit of work on Japan engaging for the students. Thank you!" West Africa - "Wow! This was a wonderful packet and it was perfect for my class of kids who are at different levels because I could give them different assignments. Awesome!!" The Americas - "I love your resource and use it in my class! My students truly understand this because of how you organized it. Thanks!!!" 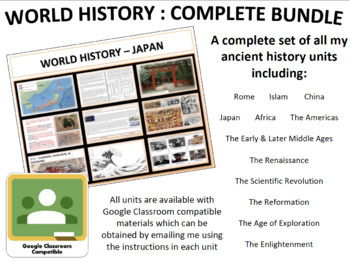 The Early Middle Ages - "Amazing, amazing, amazing resource! So many beneficial pieces for the cost, including the ability to download larger editable files. Super impressed!" The Later Middle Ages - "I've purchased unit plans from a fair number of sellers on tpt, and I've purchased 8 unit plans from MrGray so far, and his, in my opinion, are by far the best. They are thorough and complete, with everything you need to teach the whole unit. Many of sellers give lots of activities, but the students must find the content elsewhere to complete them with. MrGray gives all the content needed. Many different kinds of student activities are included and everything is perfectly aligned. Tests too. And the powerpoint presentations are nothing short of spectacular!! So many ppts from other sellers are so so at best. MrGray's are truly impressive. I plan on purchasing every unit he offers that matches up with the subjects I'm teaching. I highly recommend his products!!! Actually, that's an understatement!" The Renaissance - "WELL worth the money. Could/should be more! Consistently used and received well in my middle school classroom--very effective--thanks so much!" The Scientific Revolution - "As always, absolutely top-shelf materials. 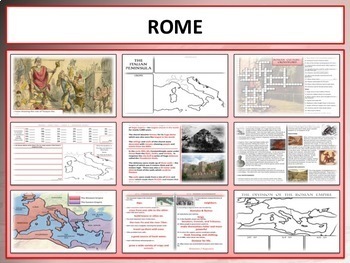 The powerpoint engages students in multiple ways, and fires up their interest and curiosity. The worksheets take scientific concepts that students can have difficulty understanding and break them down into clear points that they can more readily understand." The Reformation - "Fantastic resource! Got this on the very strong recommendation of a colleague and I am so pleased that I did. It's thoughtful, interesting, easy to use, and visually appealing. Also, SUPER helpful creator!" The Age of Exploration - "If you buy nothing else, buy THIS. It is thorough, complete, requires nothing but print-and-teach, and is worth every cent. Truly. Consistently used and received well in my middle school classroom--very effective--thanks so much!" The Enlightenment - "This pack was extremely helpful! It was perfect for my 6th graders for our French Revolution unit!"